Marinated pork medallions roast to a tender, juicy finish in the oven. Purchase pre-marinated pork medallions or make your own marinade to add flavor to the meat. 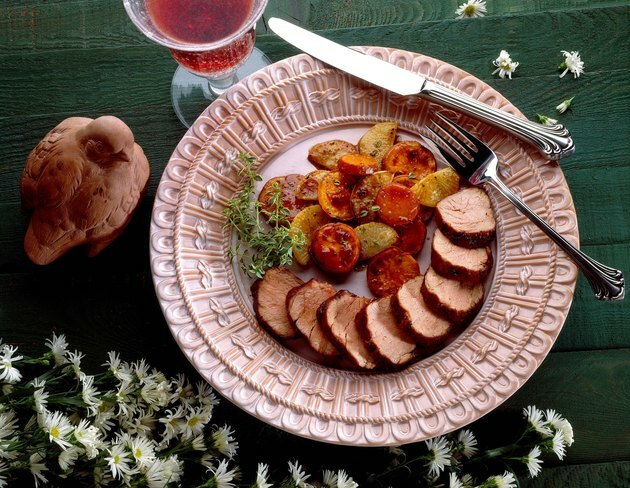 Pork medallions are not low fat, but they are a good source of many vitamins and minerals, such as thiamine, riboflavin, vitamin B-6, niacin, phosphorus and selenium. Trim your pork loin medallions before you roast them to reduce the fat content, and keep the portion sizes to 3 ounces to cut down on both the fat and cholesterol. Place 1 pound unmarinated pork tenderloin medallions in a large resealable plastic bag. Pour in 2 cups of prepared marinade, or combine two or more of the following ingredients to create a marinade that suits your palate: 1/4 cup olive oil, 1 cup orange juice, 1/2 cup lime juice, 1 cup teriyaki sauce, four crushed garlic cloves, 1 teaspoon ground ginger. Seal the bag and place it in the refrigerator overnight. Take the pork medallions out of the refrigerator and leave the bag at room temperature while the oven preheats. This allows the pork to warm up in the marinade, which will keep it more tender and moist as it cooks. Place the medallions in the baking pan and pour the marinade over them. Place the pan in the oven, uncovered, and roast the medallions for 15 to 20 minutes, or until an instant-read thermometer inserted into the center of the meat reads 140 degrees Fahrenheit. Take the medallions out of the oven and allow them to rest for five minutes before you serve them.